In 2016, independent Swiss watchmaker Armin Strom introduced the Mirror Force Resonance, which features a mechanical movement that operates with a true resonance system. 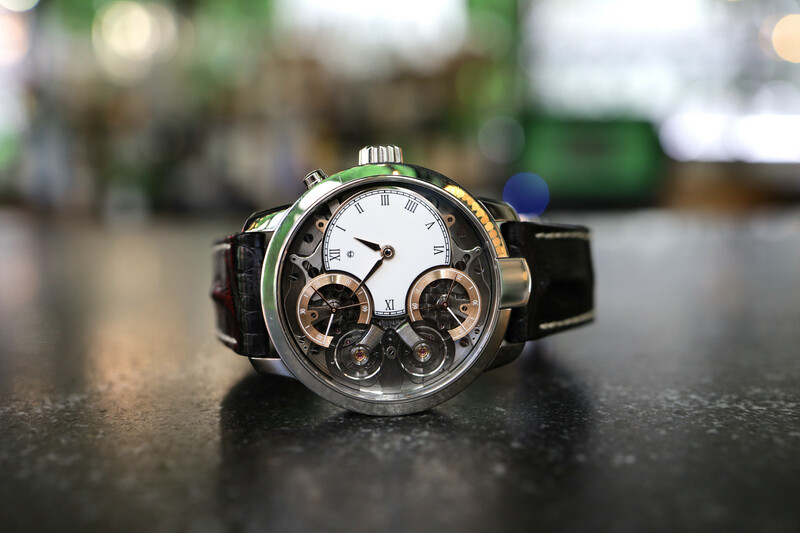 Armin Strom’s in-house team designed the movement based on the phenomenon called “resonance” which increases precision and reduces energy usage by connecting two regulators via a clutch spring. When two objects with a similar natural resonant frequency feel the vibrations of the other, they absorb the energy from the other and both eventually start to vibrate at the same frequency. Today Armin Strom launches the Masterpiece 1 Dual Time Resonance, a more complicated timepiece built on the same patented technology they created for the original Resonance watch. Each of the sides of the movement has its own crown with separate winding, two power barrels, and a regulating assortment (balance wheel, balance spring, and escapement). The balance wheels counter-oscillate at 3.5Hz (25,200 vph) and wedded by a patented Resonance Clutch spring, just like on the original Mirrored Force Resonance. Unlike the original, this watch requires a lot more power because its effectively two independent watches (sharing one mainplate), which is quite different from the original Mirrored Force, and explains why there are now four mainspring power barrels as opposed to two. The Resonance Clutch Spring, which took 3-years to perfect, is the key to Armin Strom’s use of resonance and it’s on full display at 12 o’clock, in the center of the two balance wheels which are supported by a frosted rose gold bridges on each side. When the watch starts, each wheel is not necessarily in sync, however, within ten minutes or less they start to oscillate at the same frequency, and are at that point: in resonance with one another. “While it has been long known that resonance in watch and clock movements with synchronized coupled oscillators improves accuracy by averaging slight differences in the precision of each movement and in wristwatches minimizes adverse effects of shocks on precision. Less known is that resonance also conserves energy: vibrational energy that is normally be lost through the support of the regulator is conserved in the system,” according to the manufacture. Armin Strom’s laboratory testing has revealed gains in precision of 15-20% for two COSC chronometer-level regulated movements placed in resonance. 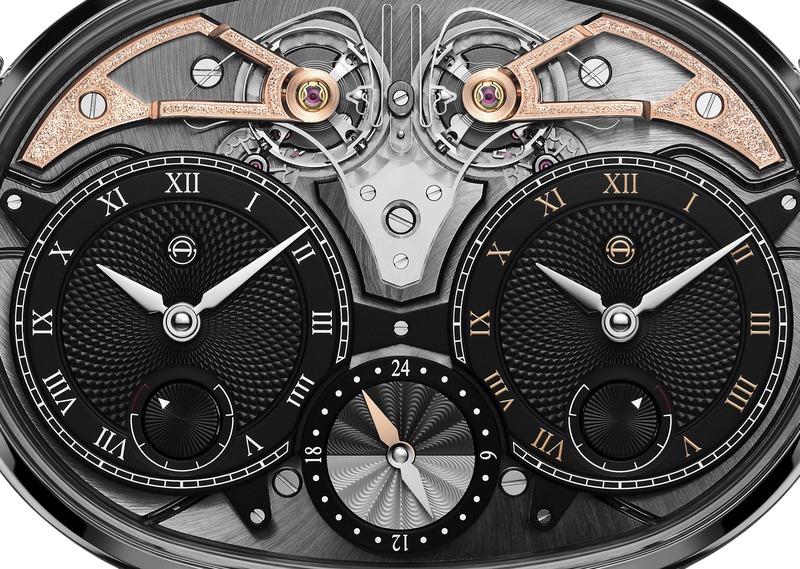 Further, the CSEM (Centre Suisse d’Electronique et de Microtechnique) has officially certified Armin Strom’s resonance system based on the clutch spring as being a true system in resonance. 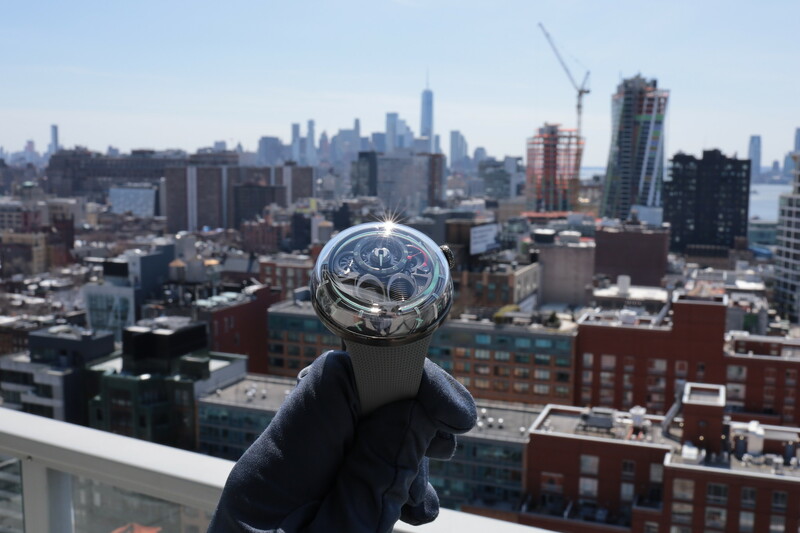 Thanks to the independent movements the wearer can track two time zones. Additionally, in the center of the two dials is a 24-hour indication which shows whether it’s day or night in either of the timezones via a double-sided hand which is coded in either silver or gold, matched to the hour markers and logo on the left or right dial. Each of the dials features a hand guilloche pattern in the center, created by Finnish master watchmaker Kari Voutilainen. At the 6 o’clock position on each dial is an independent power reserve indication representing a max of 110-hours driven by two barrels (four in total). Voutilainen’s work is also seen on the central day/night indicator. Hours and minutes are indicated by polished lance-shaped hands, and there are no indications of seconds (which differs from the original Mirrored Force Resonance), just the oscillating balance wheels which show the wearer the watch is operating. The movement is finished to very high standards, with finishes including circular Geneva stripes, chamfered and polished edges, mirror polished screw heads, circular graining, ruthenium plating, and perlage. The movement measures 52.55 mm x 39.95 mm x 11.67 mm and utilizes 70 jewels and 419 components in total. This is a true dual time movement and each side features its own 110-hours of power reserve driven by two barrels a piece. The Armin Strom Masterpiece 1 Dual Time Resonance launches in a limited edition of 8 pieces in Grade 5 titanium. The case measures 59 mm x 43.4 mm x 15.9 mm and is water resistant to 50 meters. Retail is CHF 180,000. Whether the case shape is to your liking or not, one thing is for sure: this is a horological masterpiece. Unlike many complicated watches on the market, chronometry is improved, and according to Armin Strom this watch is chronometer level accurate, and so it’s not about aesthetics, despite the incredibly mesmerizing visuals, both front and back.